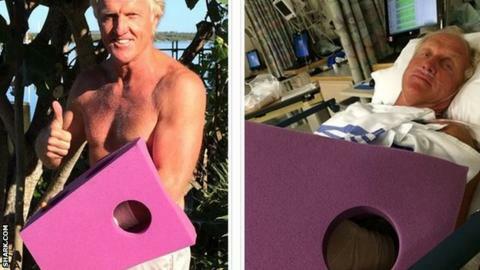 Golfer Greg Norman said he had a premonition about the chainsaw accident in which he nearly lost his left hand. The 59-year-old Australian told the BBC that he felt "extremely, extremely lucky" to escape serious injury. "I had a premonition, to tell you the truth, as I was getting my chainsaw ready that something bad was going to happen," said the two-time Open winner. Now recovering at home, Norman said he hopes to hold a putter within three weeks and play golf next month. He injured himself while cutting some tree branches on Saturday afternoon at his property in Jupiter Island, Florida. "It was just one of those unfortunate incidents," said the golfer, known as the Great White Shark because of his distinctive blond hair and aggressive style of play. "I've done a lot of chainsawing my whole life. I've done it out on my ranch in Colorado, I do it at home, I cut up firewood, it's something that's not unfamiliar with me. I'm very aware of chainsaws and wear all the right protection when I do it. "I had this premonition and almost pulled out of it, but I thought it's not a big tree, not a real difficult task to do. "We all have premonitions. That one was just unusually prophetic I guess. I nearly didn't go down and chainsaw. The moral of the story is to trust your internal mechanism." Norman said he had nearly finished his tree work when the freak accident happened. "I was about four branches from being done, and there was one branch about chest high and I cut through and took my finger off the trigger," he said. "The branch was just about ready, was falling straight down, and I went to grab it with my left hand, but it was a little heavier than I anticipated. "The weight took my arm, right above where you wear your watch on your left wrist, and took it right into the chains as it was spooling down. "I was very lucky in a lot of ways. If the chainsaw was going at full speed my hand would have been cut off and it missed my ulna nerve and muscles, so I was extremely, extremely lucky in that regard, by fractions of millimetres." "I actually felt the teeth of the chainsaw ripping my skin and flesh apart." Norman said he calmly pulled a mobile phone from his back pocket, called his wife and asked her to bring a towel and tourniquet for the injury. "I wouldn't let my wife see the wound because it wasn't a pretty sight," he said. He then rang his son to take him to hospital, and called a doctor friend so medical staff would be ready for him. "It was strange. I had no pain at all. Zero pain," he said. "I actually felt the teeth of the chainsaw ripping my skin and flesh apart. I think I deal with situations quite well - I stay calm. To me, taking a lead and taking control was an important thing and I got everything in place in 90 seconds." At the hospital, he saw a hand specialist and underwent surgery for about an hour to repair some minor nerve damage. Professional victories: 91. World number one: 331 weeks (equivalent of more than six years). Major wins: 2 - The Open, 1986 and 1993. Since the accident, Norman has updated fans with posts on his social media accounts and said he been overwhelmed by messages of support. "The reaction has been incredible. When I sent the picture out on my Instagram account I didn't appreciate the magnitude of the event or the outflow of support which has been absolutely phenomenal," he said. "That's why I went out the next morning, even though I had a lot of painkillers in me by then, to give the thumbs up and show everyone I'm going to be OK.
"You probably underestimate the value of your hands because you use them so much. Quite honestly, I don't know what I would have done without a left hand. It makes you appreciate how lucky you are in life." Norman led the golf world rankings for 331 weeks in the 1980s and 1990s. As well as his major wins at Turnberry and Royal St George's, he finished runner-up in two US Opens, two US PGAs and three Masters. In 1996 he famously blew a six-shot lead at Augusta to hand victory to England's Nick Faldo. Despite his accident, Norman - who has featured in Seniors events - hopes to play in a pro-celebrity event in China at the end of October. "I've already started doing my own rehabbing exercises by putting the index finger of my right hand into my left hand and gripping it like a golf club, squeezing my top three fingers," he said. "If my recovery allows me to getting back to hitting balls in three weeks, I think I'll be back with a putter in my hand, maybe a chipper just to see how I feel. That's Greg Norman's word for it though, not the doctor's." "I've had thousands upon thousands of messages. Thanks for all the support and the well wishes. I really do appreciate it. Thanks everybody." Norman said the well-wishers have included Graeme McDowell, who will play for Europe against the United States in the Ryder Cup at Gleneagles this month. "I've got a lot of support from a lot of the Ryder Cup players, which has been fantastic. I like the Ryder Cup, I've always enjoyed it," he added. "The Europeans seem like they have the upper hand with the emotional side of it. They have the upper hand because they seem much stronger on paper, but on the other hand they have to be wary. "I think the USA's strength may come from their rookies, who may step up to the plate and be a little bit better than everyone is anticipating."